For the final part of our assignment this week we had to create an original image which represented our concept and idea of a PLE. I spent a lot of time thinking about what I wanted my image to be. I am quite a visual person so I wanted it to look good but spent too long playing with Photoshop. I even went to the IT department and borrowed a Bamboo drawing tablet and pen so I could create an original drawing. As usual, I was off on the wrong track. If I could only remember my wife’s advice that I am always wrong, then I would regularly dismiss my first idea and go straight to plan B. The end result (my learning) is created from a mixture of what different inputs I have. Just by listing those things, it came to me. My PLE is a recipe. 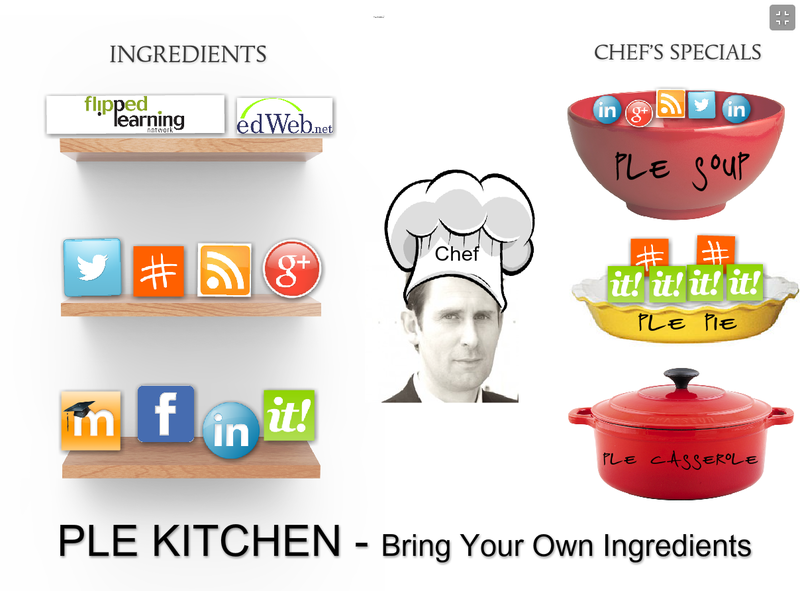 I use ingredients and select, decide, choose, add, adjust, taste and create something for myself or others. The subtlety is mine, the final flavor might be different from what I expect and if done correctly I feel satisfied. Yup. My PLE is Pie, Soup and Casserole. I have created this image to reflect that. The PLE Kitchen. I used Glogster which is limited but did the job. I hope it makes sense to you all. It does to me. After posting this, I spent some time reviewing and commenting on my peers’ images in our Facebook group. A couple of thoughts jumped into my mind in terms of comparing their images to my own. Firstly, all of the images I reviewed involved the use of icons to represent different sources, combined with a different and personal interpretation of how each person processed and made sense of them. To that end, mine is very similar. Where mine differs from some, is that my image is quite linear. Input, process, output which is different from a few who had chosen the circle concept to represent their processing. Matt’s was similar to mine in that respect. All of the images I looked at had thought and refection evident in both the concept and the execution. I went for a metaphor to deliver my message which again was different from most images. It is just my own style – I learn from analogies and comparisons. What was evident was the caliber of my peers on the course. Everyone had put in effort and thought to their images and while many of us took a similar approach I got something out of each image I reviewed. Thanks to everyone.